With Lithium batteries now becoming more popular we thought to provide some insightful and updated information on Lithium Ferrous Phosphate (LiFeO4) batteries, also known as Lithium Iron Phosphate or LFP batteries. 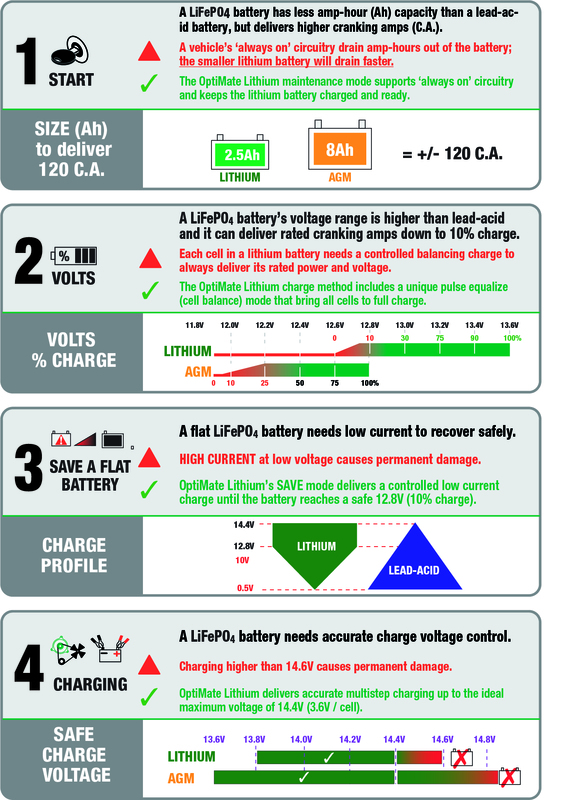 Here is a quick reference chart that provide 4 facts why LFP/LiFePO4 batteries are different to lead-acid (STD flooded, AGM or GEL) batteries and why you need an OptiMate Lithium battery charger that guarantee performance of your lithium battery. Below these 4 reasons are more articles you can read. View / download a pdf version.